My father used to urge me to write a piece about how overrated Muhammad Ali was as a fighter: the disputed win over Henry Cooper, the carefully picked tomato cans in the early years, and the tactical heresies of dropping his hands and leaning back from punches. He had been a champion collegiate and Marine Corps heavyweight, and he thought Ali had damaged the sport by influencing too many young men, black and white, with all the wrong ring tendencies. Yes, Ali could get away with it because of his athleticism and guile, but his was a dangerous path for anyone else. For all my father’s personal rebellions against the conservative structures of his youth, when it came to boxing, he was a strict constructionist. He was loyal to Joe Louis for his power, for his textbook craftsmanship and the symbolism of his victory over Max Schmeling. And I never doubted that my father admired the fact that Louis served in the military and carried himself with “dignity,” a hopelessly loaded compliment when given by a white man to a black man in Jim Crow America. If Jack Johnson challenged the notion of white superiority like no one before and Louis gave black America its first global hero, Ali served as a final test of social consciousness as the nation began to reconcile its racist history. I know that sometime during the 1960s, after 16 years of Jesuit education and eight years in the Marines, my father became a political and social liberal, inspired by the Kennedys and bristling against the institutions that had raised him — the church, the suburbs and the Corps. The young Ali, however, served as the outer boundary of my father’s rebellious limits. The braggadocio was beyond comprehension. The Nation of Islam was beyond the pale. The refusal to step forward when his name was called … well, that took some time. It brings me to the aspect of Ali’s legacy I’m least comfortable with. His embrace by mainstream white America, by men and women like my father, was possible not simply because of the stances he took but because of the prices he would have to pay, that we always ask black heroes to pay. Ali’s brashness and blackness were outside the margins of what most progressives were willing to embrace for much of his career. 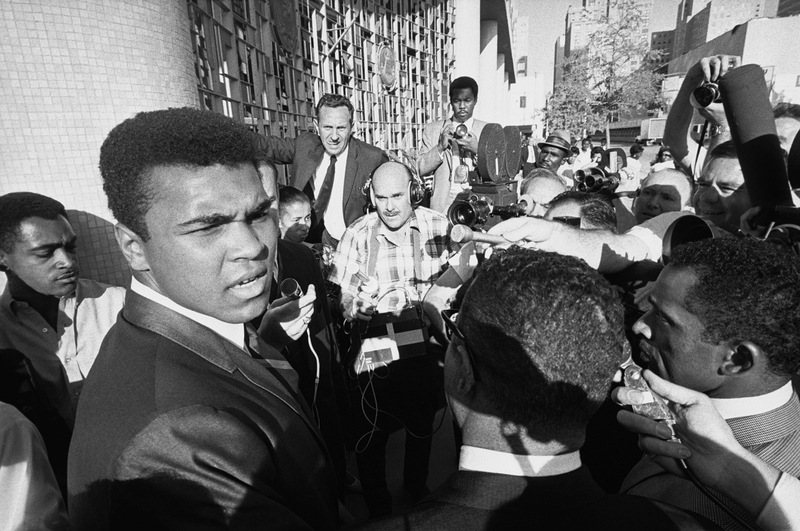 Former world heavyweight boxing champion Muhammad Ali (L) is surrounded by journalists as he leaves the federal court after a jury found him guilty on charges of refusing to be inducted into the U.S. armed forces. Clay contended that he was a Nation of Islam minister and not subject to the draft. As the country’s attitude about Vietnam changed, those lines expanded to include Ali, but to bring him safely onto the pitch he had to be knocked down by the government and fight his way back. He had to absorb a mythic left hook from Joe Frazier, fall, and rise, only to lose that first fight. He had to come back to beat Frazier. He had to beat George Foreman, hulking, brooding, unlovable George Foreman (who would later become lovable and sell electric grills). He had to prove that his bravura was backed by a toughness that even skeptics couldn’t deny. But he had to be punished before he could be loved. Ali entranced so many black Americans with his genuinely rebellious militancy and his willingness to forgo the trappings and the windfalls of being an “acceptable” champion to white America. And he inspired white Americans who sought a similar rejection of the old order and wanted to tear down constricting structures. But his transformation to cross-cultural icon came only after breaking with the Nation of Islam, and then slowing down in the ring and losing terrible fights and, finally, becoming an international ambassador for peace. In that sense, the defanged Ali became a handrail for Americans who needed to make the next leap in racial thinking, with other leaps still to come. My father, who was captivated by Ali when they met through friends in 1968, grasped that rail, making a truly remarkable progression from the intolerance of his upbringing to being willing to transform on race and politics. It was a remarkable journey, but not a complete one. He admired Ali greatly for his courage and principles. But to embrace Ali in full is to embrace Ali the revolutionary, not merely the Ali who was safe enough to accept a medal from a conservative president. By rejecting white society for part of his career, Ali tested the limits of what America’s mainstream liberalism would tolerate. His evolution into pitchman and peacemaker made him a touchstone safely within any margin of dispute. Decades after brutalizing men who dared call him by his birth name, he profited off shirts emblazoned with “Cassius Clay” in the Muhammad Ali Center gift shop. But the limits are still out there, still as perilous, still as incomprehensible. And out there on that margin is the image of a young man who was bold enough to call his oppressor a devil, and audacious enough to taunt an opponent with his hands at his side.